We're now just two weeks away from the release of Rogue One: A Star Wars Story but we needn't forget that we're also only about a year away from Star Wars Episode VIII. With the focus on Rogue One this year, much of Episode VIII remains shrouded in secret. And it will stay that way if Gwendoline Christie has anything to say about it. 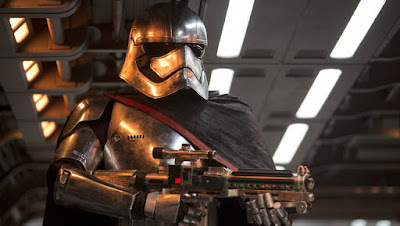 Christie starred as Captain Phasma in The Force Awakens and will be reprising the role in Rian Johnson's sequel, hitting theaters in December 2017. Entertainment Weekly caught up with Gwendoline Christie recent and asked if she could tell them anything about the film. Her response? When pressed for more information, Christie told them, "I don’t think anyone’s going to be disappointed". But will Captain Phasma disappoint? There's no way we're going to know a single thing officially about Ep 8 until after Rogue One. They wouldn't want to cause any reason to down play the first spin off. But I trust Disney to hold all the new films to a high standard. Especially the numbered ones.